A photo circulated by the Taliban of new leader Mawlawi Haibatullah Akhundzada. Afghanistan’s Taliban says Mawlawi Haibatullah Akhundzada has been appointed the new chief of the group following the death of Mullah Akhtar Mansoor. In a Pashto language statement on Wednesday, the Tailban also formally confirmed Mansoor was killed in a U.S. drone attack last week. “Mawlawi Haibatullah Akhundzada has been appointed as the new leader of the Islamic Emirate (Taliban) after a unanimous agreement in the shura (the supreme council), and all the members of shura pledged allegiance to him,” the Taliban statement said. 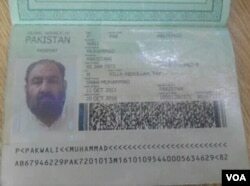 A photo shows the Pakistani passport and ID card that Mullah Akhtar Mansoor was allegedly carrying. Mansoor was killed in a U.S. drone strike Saturday near the Pakistan-Afghanistan border. U.S. President Barack Obama confirmed on Monday that Mansoor was eliminated because he was blocking Afghan peace and reconciliation efforts. The new Taliban leader was a deputy to Mansoor along with Sirajuddin Haqqani, the leader of the notorious Haqqani network. Haqqani has retained his position while the son of the group’s founder, Mullah Yaqoob, has been appointed as a second deputy to the new Taliban chief. Haibatullah is described by some Afghan observers as “a typical village type” Islamic cleric, like the group’s founder, Mullah Omar, and expect his two deputies to play the central role in Taliban military affairs. Afghanistan security forces inspect the site of a suicide attack west of Kabul, Afghanistan, May 25, 2016. Wednesday’s announcement came as a Taliban suicide bomber killed at least 11 people and wounded several others in Kabul. 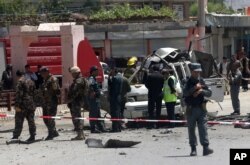 Afghan police say the attack targeted a minibus carrying judicial officials. A Taliban spokesman, Zabihullah Mujahid, said the attack was carried out in reaction to the execution of six Taliban members earlier this month after they were sentenced to death by the Afghan judicial system. The U.N. Assistance Mission in Afghanistan (UNAMA) condemned the suicide attack that it says killed and wounded civilians, including children. “Attacks against judicial authorities are cowardly and contrary to international humanitarian law,” said UNAMA chief, Nicholas Haysom, demanding accountability for the perpetrators. With Their Leader Dead, What are Afghan Taliban Doing?